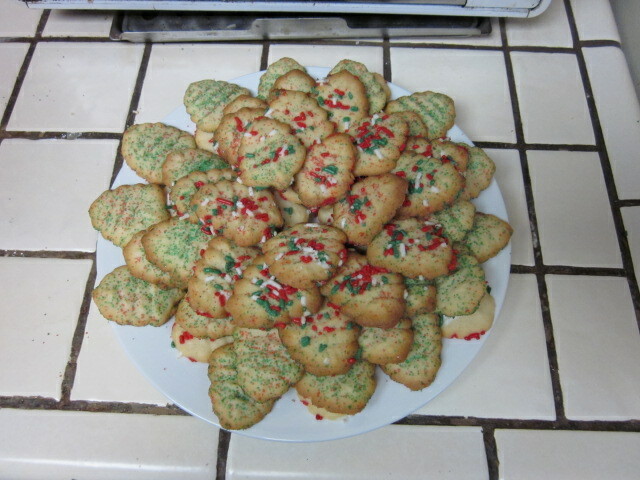 While my sister, Dovima, and I pound Trader Joe’s Brandy Beans by the fistful, her daughter, my niece and heir to my string collection, Sweet Pea, is busy baking all the Christmas cookies. Gotta say Dovima has raised that kid right! 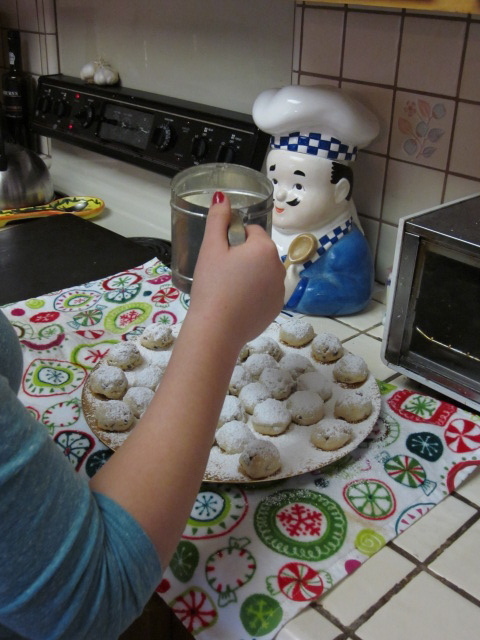 Sweet Pea is baking snowballs, press cookies and Oreo Truffles. 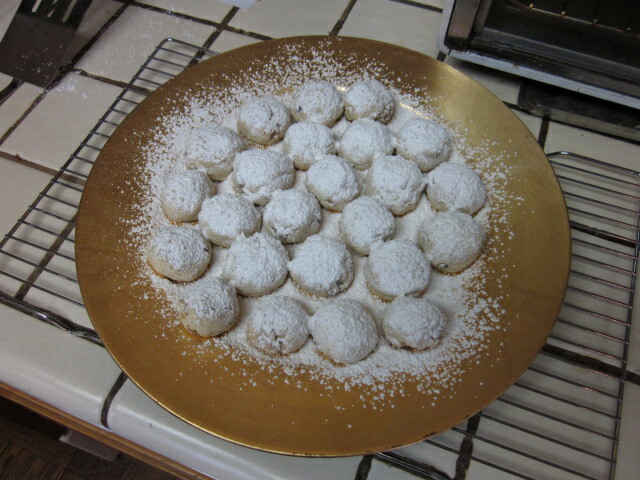 Snowballs, also called Mexican Wedding cookies or Sandies (a name preferred by our late grandmother, Vesuvius) are my favorite. 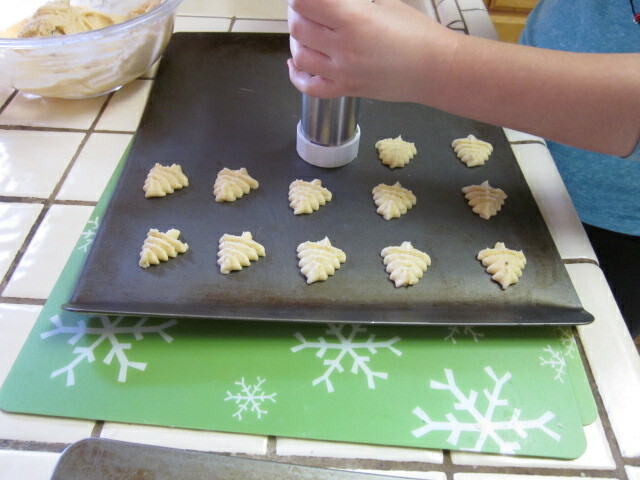 Sweet Pea is baking those first. Cooling sheet of naked snowballs. 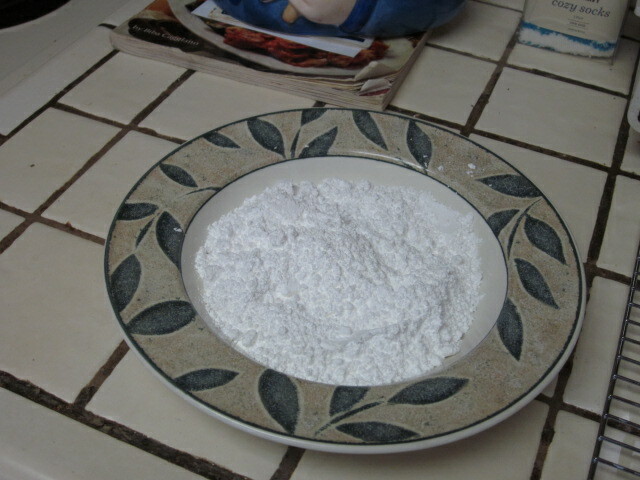 Bowl of powdered sugar snowball dressing. 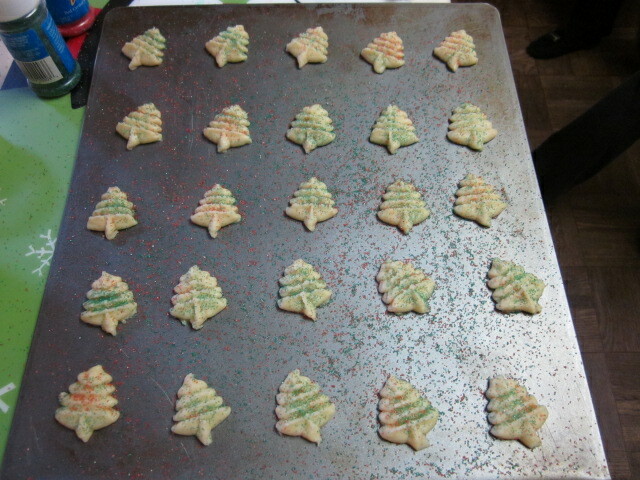 After baking the snowballs Sweet Pea moves onto another holiday hit, press cookies in the shape of Christmas trees. With the leftover dough Sweet Pea makes three freak-shaped cookies – one each for her mother, father and aunt, which we eat while watching The Girl with the Dragon Tattoo at the multiplex. 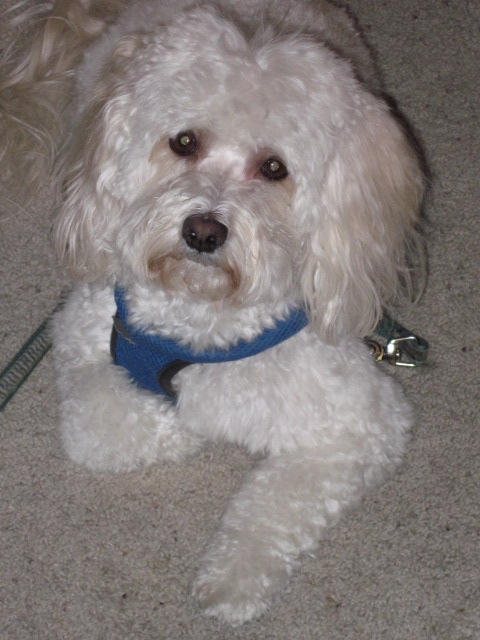 Herb: Honey, there were times during the movie when I wanted to stand in front of the screen with a hearing horn! 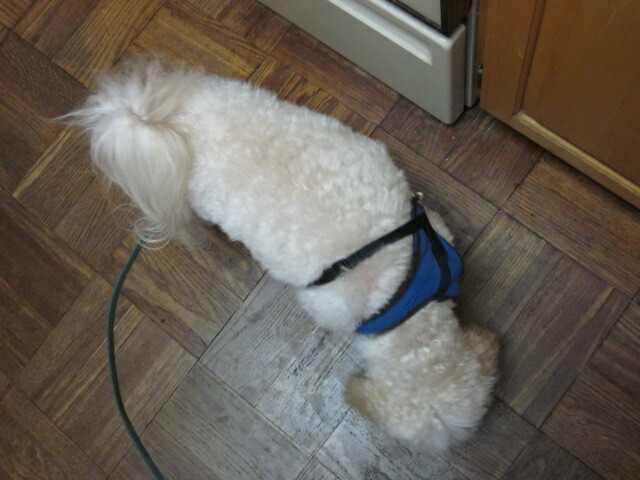 His attempt at delivering a comforting lament fell on deaf ears. Overall, this film is a very entertaining thriller and probably even better if heard in its entirety. 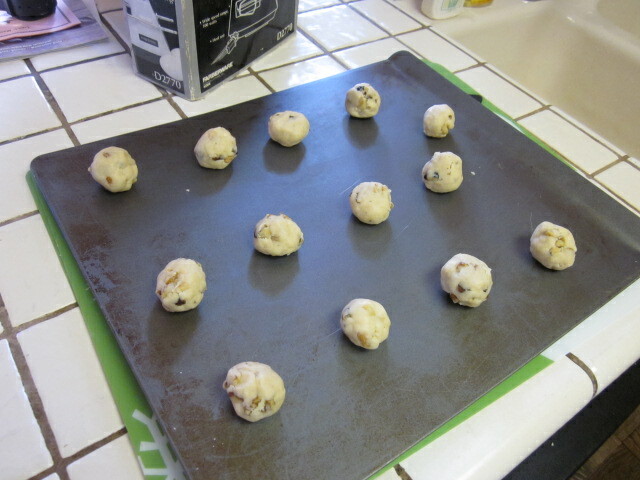 Back to cookies, after baking the press cookies, Sweet Pea made some Pillsbury slice and bake for a friend of hers. Product placement shot like Coca Cola and Marlboro cigarettes in The Girl with the Dragon Tattoo. Dovima and I, the official tasters, tried a few of those. 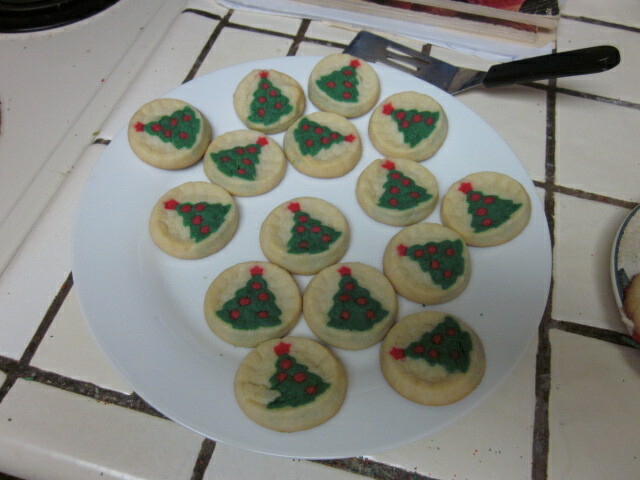 Surprisingly, they were pretty good. Dovima: What do you think’s the center stuff that makes them taste so good? Me: Probably a lot of hydrogenated fat. 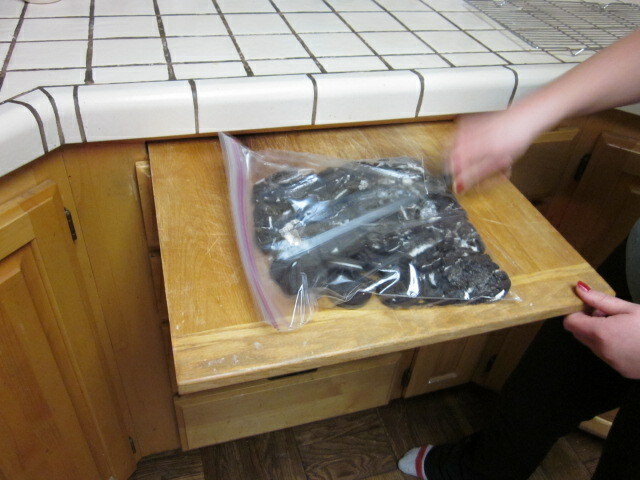 Then, Sweet Pea made her own favorites, Oreo Truffles. Just smash a package of Oreos to smithereens, mix in a brick of cream cheese and refrigerate for two hours or freeze for 45 minutes. 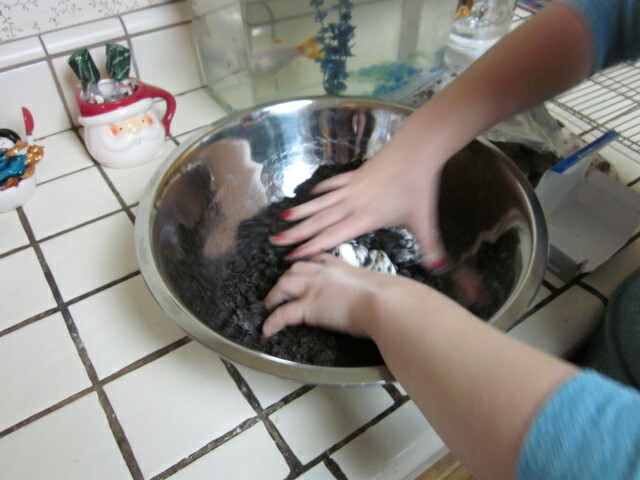 Mixing cream cheese with Oreos. 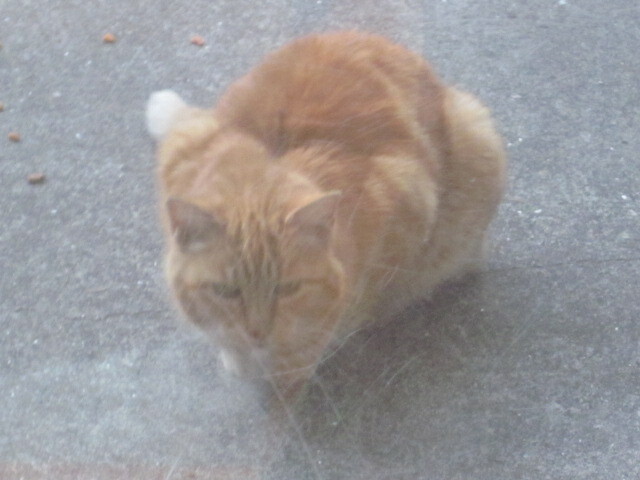 Outside cat taunting Thurber, "Hey Big Dumb Wuss!" 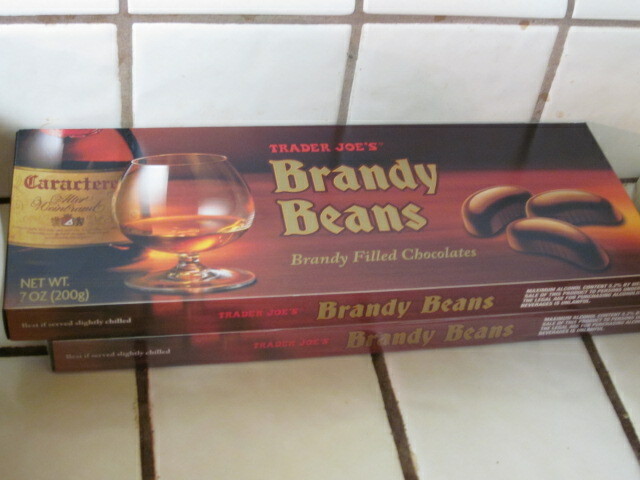 Highly not recommended for the lactose intolerant set. 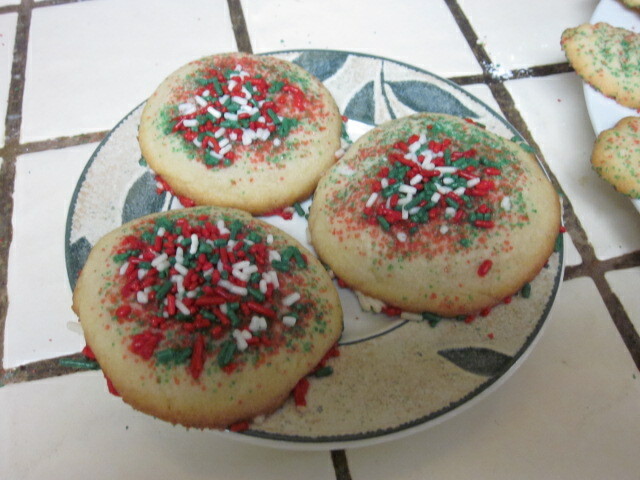 This entry was posted in christmas, holiday, Humor and tagged baking, cat, cookies, dog, family, holiday cookies. Bookmark the permalink. YUM! Snowballs are my all time favorite! So easy to pop a hundred in your mouth in just seconds. 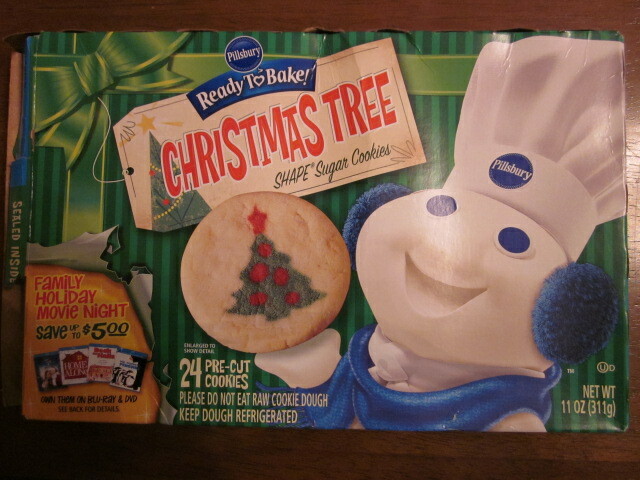 Thank you for the cookie taunts – I’m going over to my sister’s in about a half hour to start eating our cookies. I liked the Swedish, original version of the movie – even though you had to read subtitles it was so worth it! I think I’ll skip this Americanized version. That is so true about snowballs! Unfortunately, they then expand in your gut seconds later! If you do see the American version of the film, it does star Daniel Craig. I’m sure he’d help you get through it. Okay, I’m 2 days late getting here, but those snowballs still look great! Hope you all had a Merry and Lameless Christmas! The snowballs are terrific. I’ve been stuffing myself royally out here. It’s been a fat-filled Christmas. Feeling like a Winnebago on feet. 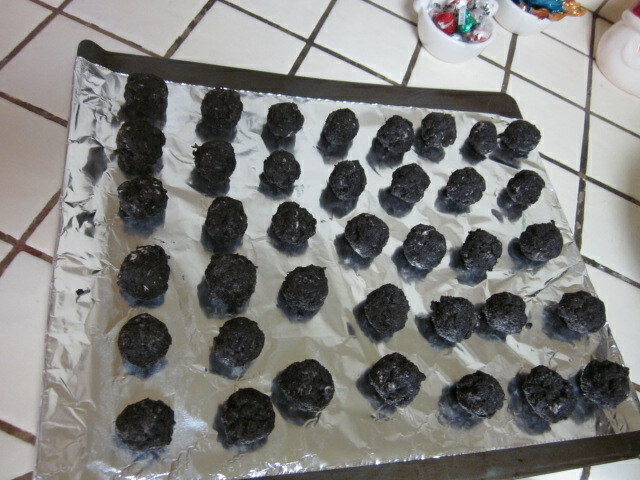 OMG Oreo truffles? Oreos with cream cheese! Dayum homie! Yes, you’ve got that right, Pal. I wouldn’t go near those with my problematic guts, but my 84-year-old father who has the intestinal fortitude of a goat, told me that they were delicious.